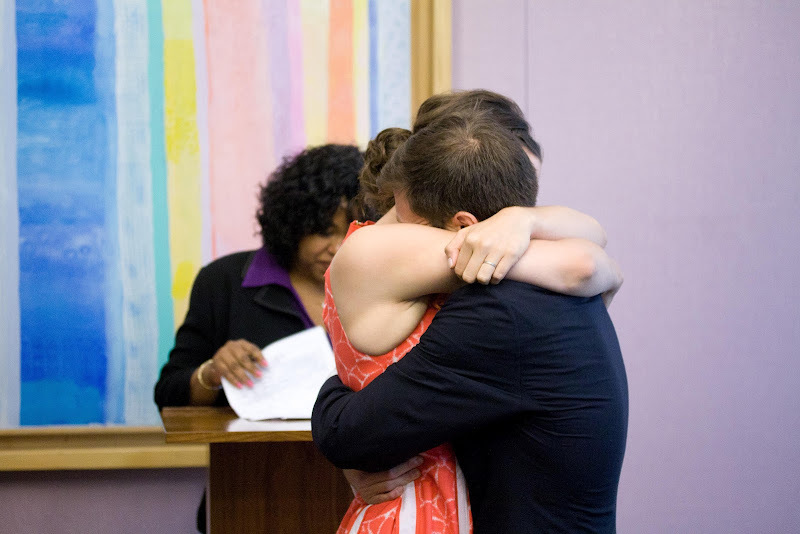 I am delighted to announce that on August 10, 2012, we (M & J of Second Floor Walkup) got married at NYC's city hall! It was an immediately-family-only gathering with a casual "backyard" (read: 1BR apartment terrace) BBQ afterward. As an avid baker, I decided to take on the challenge of making our wedding cake - a two-tiered gluten free chocolate cake with vanilla buttercream. It shall henceforth be known as The World's Best Wedding Cake. I used the gluten free chocolate cupcake recipe I posted a few months ago as well as the frosting recipe from that post (though I made about 20x the quantity of frosting, and doubled the amount of salt). I started on a Wednesday by making two 8" round cakes and one 6" round cake - the 8" cakes came out to about 2" thick and the 6" cake was about 4" thick. Since cake mixes can sometimes get wonky if multiplied, I made it 3 separate times rather than one triple-sized batch. My 8" pans have removable bottoms and the 6" pan is springform. Each pan was lined with parchment paper, which was sprayed with nonstick cooking spray and dusted with (gluten-free) flour. The 8" cakes cooked for about 40 minutes and the 6" cake cooked for about 1 hour at 350 degrees. The cakes are done when a toothpick inserted into the middle of the cake comes out clean - start checking around 30 minutes, to ensure you don't overbake. Allow the cakes to cool in the pan for about 10 minutes, then remove to a wire rack to cool completely. 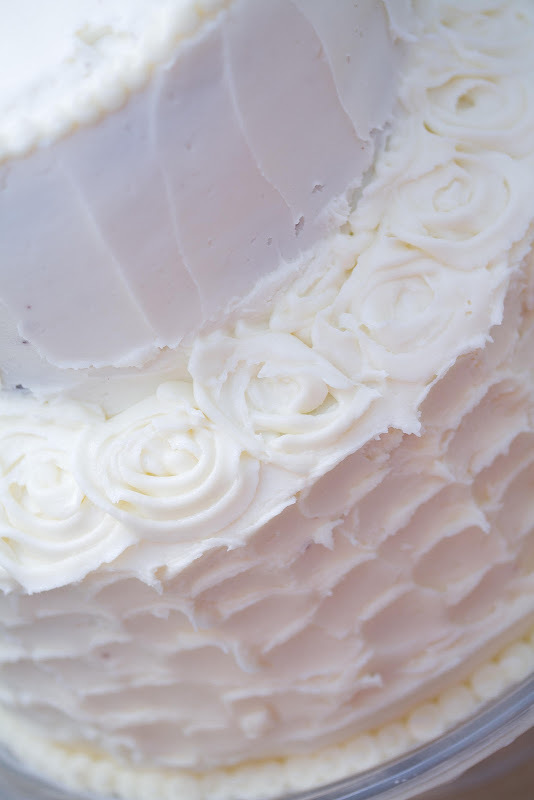 Once cooled, wrap the cakes securely in plastic wrap and freeze until the day before your event. On the day before the event, move to the refrigerator to thaw. After cakes have thawed for a few hours, whip up large batch of frosting (approx. 16 oz powdered sugar and 16 tbsp butter, plus generous vanilla and salt). Slice each of the cakes in half; frost the bottom of each sliced section generously, in a continuous swiping motion, so that all of the cake surface is covered and frosting hangs over the edge. Stack the cakes back together, and then frost the top section of one 8" cake and stack the other 8" cake on top. Squish together slightly to secure the cakes and spread the extra frosting around the outside. 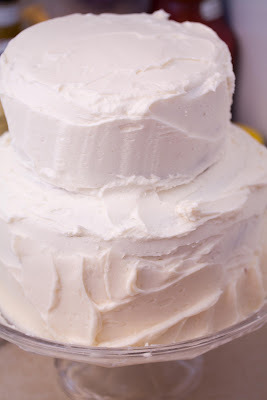 At this point, you should have one 4-layer 8" round and one 2-layer 6" round; place each cake tier on the correctly-sized cardboard cake circle, wrap in plastic wrap and refrigerate until the morning of the event. On the morning of the event, make a large batch of frosting (32oz/32 tbsp). Remove the cakes from the refrigerator. Frost each tier by placing a giant blob of frosting in the middle of the top of the cake; slowly smooth out the frosting, being careful not to pick up any cake chunks, with the excess being pushed over the edge of the cake. Frost the sides by smoothing out and pushing down this excess, adding more blobs on the top of the cake as needed. It's a tedious job, but is an easier way to ensure you don't end up with cake pieces all over the place. 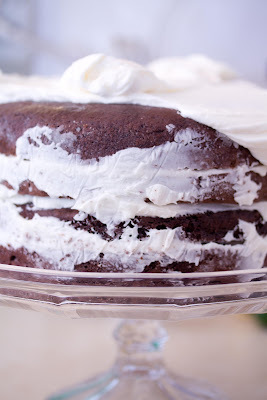 Refrigerate the frosted layers for at least 30 minutes to harden up the frosting. Remove the layers from the refrigerator and get ready to stack! Measure the required height of the cake dowels by sticking one into the center of the 8" layer and marking where it is flush with the cake top. Cut 6 dowels to this length; insert one into the center and place the other 5 in a circle around the center dowel about 3" from the edge of the cake. Carefully place the 6" tier (on its cardboard round) on top of the dowels. Hope that your cake doesn't collapse at this point. 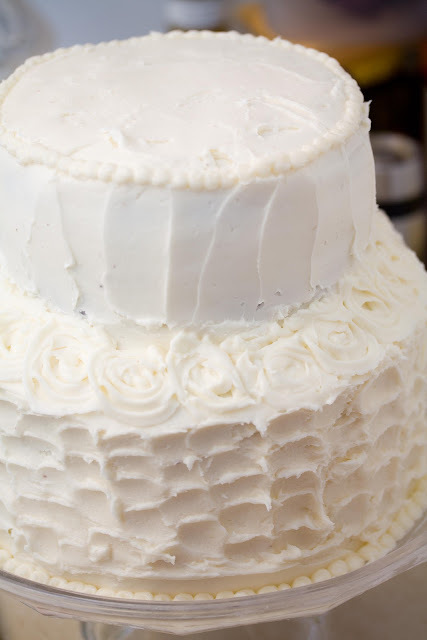 Using a pastry bag with a large circular tip, fill the gap where the tiers meet with frosting, and smooth with a spatula. At this point you should have a tiered cake more or less covered in enough frosting so that the cake and structural elements are not visible. 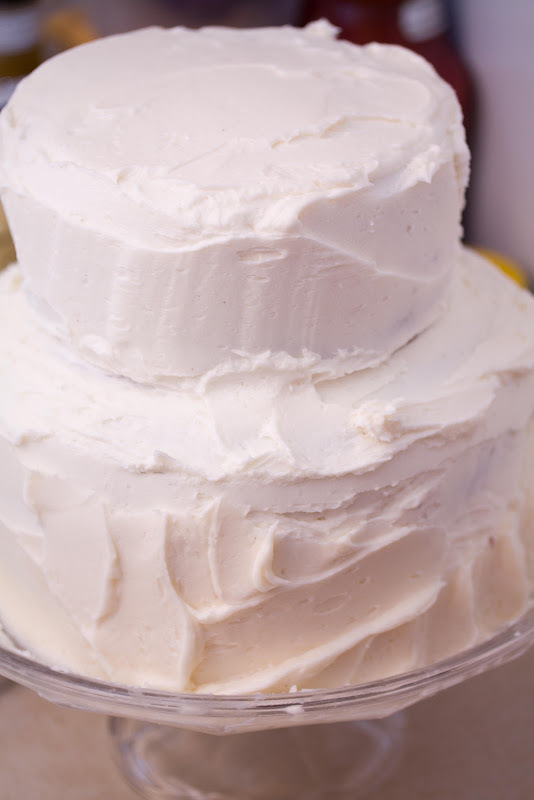 Chill the cake in the refrigerator for at least 1 hr to harden this layer of frosting - yes, NYC fridges are small, so make sure your cake is not within the blast radius of your precariously-stacked jars of pickles and jam. Remove the cake after chilling, and decorate to your heart's content. First, I smoothed the edges using a bench scraper. Then, I used a small plain pastry tip to make little dots circling the bottom of the bottom layer (and hide where it meets the cake stand). I used a star tip in a spiral motion to create flowers along the edge between the bottom and top layers, a cheese knife in an upward motion to "decorate" the sides of the top layer, the back of a spoon around the bottom layer, and then added another round of the plain-pastry-tip dots to the edge of the top layer. Voila! Delicious cake! The fam easily devoured the top layer on the night of the wedding, and we spent the next 5 days eating the bottom layer (surprisingly, we did not hit cake overload, it was just too delicious to stop eating). Yay! So happy for you both!! !